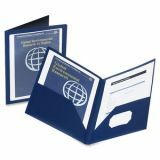 Provides a custom look with framed insertable front cover. The wing-style pockets are definitely a cut above the straight horizontal. Keeps business card at hand in die-cut holder. Note: A minimum quantity of 125 must be ordered, and in units of 125 thereafter. Oxford ViewFolio Polypropylene Portfolio, 50-Sheet Capacity, Blue/Clear - Presentation folder features a framed portfolio cover with a back-loading, bordered display window for easy customizing. 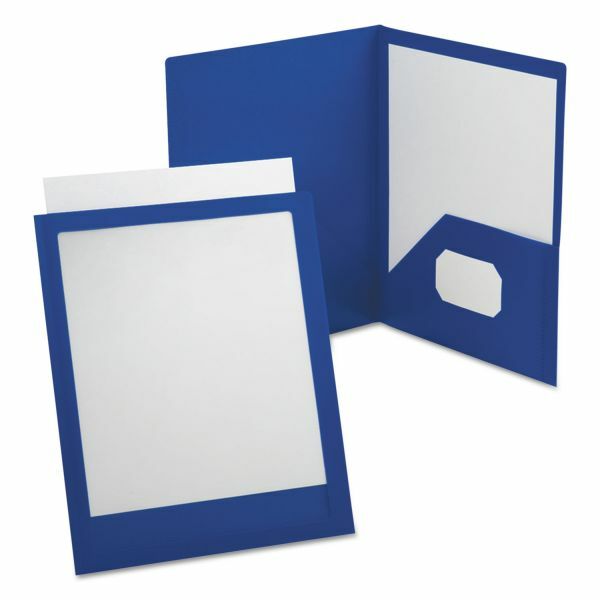 Twin pockets hold 100 sheets of letter-size paper (50 per pocket). Inside pocket has a die-cut business card holder for a complete presentation. Durable polypropylene is wear-resistant, tear-resistant and waterproof.